In Irene’s Wake | From the Seasonally Occupied Territories . . .
← Has SMF Lost the Plot? Martha’s Vineyard got off easy. The wind blew hard for hours and hours. Some trees fell. Some trees fell on power lines, but NStar, the electric company, was on the ball, cutting power before fires could get started. My power went off at 1:30 p.m. Till then I was checking Facebook regularly to get storm reports and photos from friends around the island. Oaks dancing wildly above my roof weren’t quite as dramatic as waves crashing over the seawall on Beach Road, but they were still a good show. I kept working on Hekate the laptop till her battery gave out then switched to paper. Electricity was restored about 6:47 p.m., just when the natural light through my east-facing window had faded enough to make editing impossible. Others went without for longer. I remember those nine days without power after Hurricane Bob and consider myself lucky. The good news is that I managed to survive almost five and a half hours without internet access. The not-so-good news is that without it I got more work done than I would have otherwise. The only storm damage at my house was one broken flowerpot. I left it on the deck railing because I didn’t want to crush the downward-reaching morning glory tendrils. When it thudded to the deck, I realized this hadn’t been a good idea. 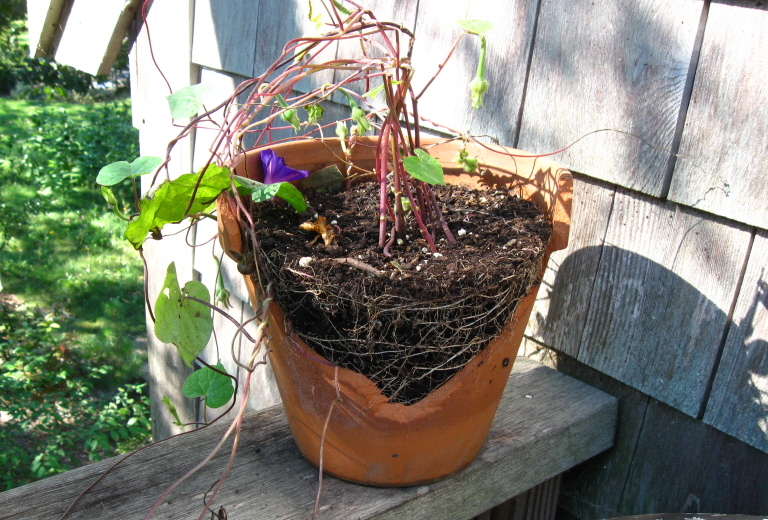 Fortunately morning glory seems to have survived and will soon be repotted. Irene brought little rain to Martha’s Vineyard, and what we got came in short downpours. The salt carried on the wind hasn’t washed away; a friend says if you lick your car it will taste like a saltine. If I’d licked Malvina Forester before the storm, she would have tasted like the dirt road I live on, so I’ll take his word for it. Malvina gets a bath later today. Around my house the leaves are still green. I’m told that as you get closer to South Beach, they’re browner and browner. After Bob, the salt-blasted leaves made it look as though November had arrived abruptly in the middle of August. The Vineyard was on the dry side of Irene. Vermont wasn’t. Off-islanders often assume that an island is especially vulnerable to coastal storms: much of Martha’s Vineyard (maximum elevation about 311 feet) is close to sea level, and we’re surrounded by water. To be sure, the lowest-lying areas, like Five Corners in Vineyard Haven, flood regularly when hard rain combines with rising tides, and the erosion along the long southern shore has been fierce. But the photos and videos from Vermont, of flooding, bridge washouts, and the devastation wrought by moving water, show that water channeled by rivers, valleys, and mountains can wreak even more havoc. This entry was posted in home and tagged Hurricane Bob, Hurricane Irene, Vermont. Bookmark the permalink. c’mon susanna lick that car. you made me laugh outloud. Flooding occurs when there is too much water in too little space. We have the whole ocean. Up until now I owned the largest basil bush I’ve ever seen. Irene killed it. Serious bummer! What was it, salt?